1964 - Some 17 years later and 16 miles outside Detroit, a cat breeder named Virginia Daly of Dalai Cattery took that quote to heart when a "mistake" in her breeding program, designed to produce an Abyssinian-pointed Siamese, produced a spotted kitten she named Tonga. Her daughter called the golden, spotted kitten an Ocicat, and so a breed was born. Virginia incorporated other Abyssinian and Siamese crosses which introduced the American Shorthair, giving the Ocicat its silver colors and adding substance. In the 1980s, the breeding of Ocicats began in earnes, and in 1986 The Cat Fanciers' Association, Inc. became the first organization to accept the breed for show competition. Ocicat breeders have chosen to continue to outcross to the Abyssinian. This allows the Ocicat to maintain a large and healthy genepool. Today, the Ocicat is a popular and unique-looking breed that is successful both in the show ring and as a wonderful family companion. The Ocicat was accepted by the Cat Fanciers' Association for championship (earning awards and titles while showing) in 1986. There have been many grand champions, regional winners and national winners since. The chocolate Ocicat has been particularly popular with the CFA's judges. Domestic in breeding, the Ocicat's personality is anything but wild. Devoted to its human family, the Ocicat will fetch, walk on a leash and harness, come to its name, and otherwise show a willingness and ability to be trained. These attributes are more similar to dogs than most peoples' impression of cats! Most Ocicat owners will say that looks attracted them to the breed, but the personality kept them. Many now own non-spotted varieties such as the classic tabby, ticked tabby, or solid (ghost-spotted) as pets. Their WILD look, easy adaptability to other animals and people, need to please their owner, easy care and general good health have made the Ocicat a popular addition to any household. The Ocicat reflects the look of a wild cat in 12 colors. The colors range from the warm colorws similar to those seen in a jungle, silver colors comparable to the snow leopard, and on to the softer, unique coloration of the dilutes. The colors are perfectly shown off by a body that is muscled and athletic with a short, sleek coat. The Ocicat walks with the stride of a wild cat and its face expresses intelligence and the look of the wild, regardless of the color. 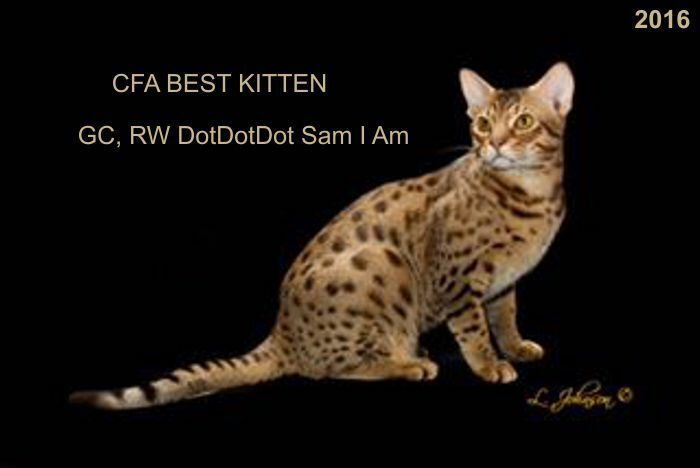 For more information about the Ocicat, see the CFA Breed Profile and article from the CFA Almanac. Interested in an Ocicat kitten or retired adult?